We are looking for a postdoc to study the effects of biochar on soil biota and plant-soil interactions. Future energy demands may be met through pyrolosis of biomass, leading to `waste` products such as biochar. Biochar, similar to charcoal, has unique biochemical properties; notably being highly stable against decay. Therefore, recent studies have suggested that adding biochar to soils may sequester carbon and improve soil quality. However, the ecological impact of biochar addition is unclear and subsequently this project aims to address this with the appointment of two postdocs. The present position focuses on the effects of soil amendment with biochar on nutrient availability and resulting plant/soil and plant/plant interactions. The project is centered around a unique 4-year field experiment in a nature restoration area in the Netherlands. The postdoc will maintain and run the field site, design and execute experiments that quantify changes in nutrient availability and soil-plant interactions using state-of-the-art ecological and soil science techniques (e.g. 13C and 15N tracing), and co-organise workshops to disseminate research findings to the scientific community. We ask for a highly motivated candidate with a doctoral degree in soil science or soil ecology, and experience with a broad range of soil analytical techniques and/or stable isotope tracing. The candidate should have organizational talents, be a team player with excellent communication skills and be willing to work abroad with international project partners for short periods of time. We offer Temporary appointment (0.8 fte) for 3.0 years, preferably starting January 2012. Salary depends on training and work experience.The maximum gross monthly salary coming with a full-time appointment will amount up to € 4374,– (scale 11, based on fulltime employment, Collective Agreement for Dutch Universities (CAO-Nederlandse Universiteiten). Dr.ir. Jan Willem van Groenigen. A detailed description of the project is available. We are working in the thematic programme “Ecology of the biobased economy: soil amelioration with biochar in a natural ecosystem”, being a joint project of the WUR (Nature Conservation and Plant Ecology Group & Soil Biology and Biological Soil Quality Group) and the NIOO (Department of Terrestrial Ecology). The programme is funded by the Graduate School Production Ecology and Resource Conservation in Wageningen. The programme encompasses both experimental research with many (inter)national collaborators involved and workshops that will contribute to the general awareness of the ecological dimension of the biobased economy. The department of Environmental Sciences of Wageningen University provides fundamental research and academic education on our living environment: nature, landscape, land usage, adaptation to climate change, water and ocean management, and the various competing claims on space. This also includes biodiversity and the sustainability of management and production. 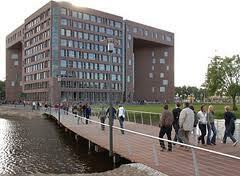 Wageningen University is part of the Wageningen University and Research Centre concern. Wageningen University and Research centre Delivering a substantial contribution to the quality of life. That`s our focus – each and every day. Within our domain, healthy food and living environment, we search for answers to issues affecting society – such as sustainable food production, climate change and alternative energy. Of course, we don`t do this alone. Every day, 6,500 people work on `the quality of life`, turning ideas into reality, on a global scale. Could you be one of these people? We give you the space you need. For further information about working at Wageningen UR, take a look at official website. Demikianlah informasi Postdoc position in Biochar / Soil Ecology at Wageningen University kami sampaikan, semoga bermanfaat.